This article is about baby dolls. In community centres in London, sewing, arts, and academics courses were available. I met a German lady there, who also had a hobby of doll-making. We decided to teach each other dolls that we knew. First, she taught me at my home how to make a cloth-made doll for children that was popular in Germany. She taught me very carefully and in detail how to make this doll. Furthermore, she also had a fantastic technique of making a gorgeous bouquet with beautiful flowers such as roses that she had grown at home. She gave me a bouquet that she had made herself. Since then, I also have been interested in flower-related arts. The following month, next I visited her home and taught her how to make a baby doll. This doll is the doll in the attached photo. It is Tynie Babe made by E.I. Horsman Co., Germany. When placed in a carriage, this baby will look like it is alive! It is about 20 cms. 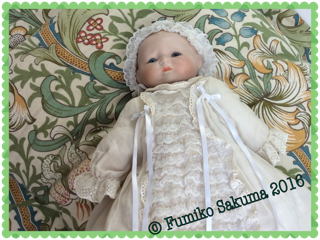 This will be the doll for my Autumn class.